Accessible pick up and play fighting game with an all girl cast. 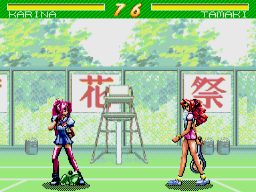 Asuka 120% has some nice character designs with a good selection of moves, and is fairly unique for its time as its fighting system differs in comparison to games like Street Fighter II. Its combos are very easy to do, you get dashes and double jumps, and can pull off aerial combos too. Maxima is the third game in the series, and the first to make it to consoles, offering a good few improvements over its forebears in content and gameplay. Sequel to the excellent Hu-Card, Download II differs quite a bit from its predecessor in that it has a Thunder Force-style weapon system where you can swap between shot-types on the fly, allowing you to pick the best weapon for each situation. Whilst I prefer the original, the game is very playable and has some good level design, presentation is fairly good, with some odd cut-scenes and lots of parallax scrolling. 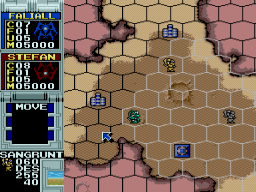 This is a fun strategy game that mixes turn-based hexagonal movement with action based battles. The game has you moving your units around the map trying to take buildings, each building you take gives you money each turn which can be used to buy a huge variety of different mech's and vehicles. Whenever you land on an occupied area a battle ensues where you control the unit and have to shoot at and evade the enemy manually. Unfortunately after a while you can easily exploit the AI in the action scenes, but its still a fun game, and there is a 2-player option for more challenge. The game also has a sequel that was not released outside of Japan that fans might want to check out. 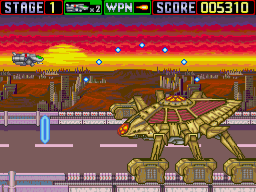 Vertical shooter that plays much like its Hu-Card predecessor, except with better graphics. The Image Fight games have you picking up a selection of pods which float beside your ship, the key to mastering the game is getting good at manipulating the Orange pods, which can be used to fire in any direction. Like the first game, Image Fight II is challenging and has tricky, intricate gameplay, it also rewards you for shooting down a certain percentage of enemies, which adds some longevity. This sequel to the highly respected Hu-Card original tends to get more of a mixed reception from fans than its beloved ancestor, and is generally considered to be inferior, but its still a very playable shmup in its own right and is worth checking out. Super Air Zonk eschews the screen-filling weaponry and frenetic gameplay of its predecessor, and puts more focus on confined level layouts and environmental hazards. Its a little short in comparison to the original but there's some interesting elements to some of the stage designs, and the presentation is still first rate, with some memorable boss designs. Excellent puzzle game from Hudson that has you throwing bombs and setting off explosions with the aim of gaining access to items dotted around each stage. 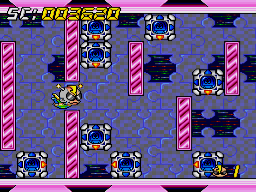 The levels each give you a limited number of bombs to find a solution to each problem, pressing Button II throws the bomb, pressing it a second time stops the bomb where it is, and holding the other button does a stronger throw. The stages are cleverly designed and often require clever thinking. 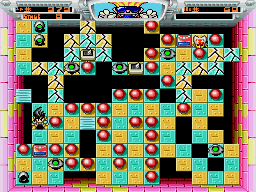 The game also has a Bomberman-esque 4-player party mode, but the play mechanics aren't really that suited to multiplayer to be honest. Avenger is a vertically scrolling shooter where your Helicopter can rotate left and right and have its aim locked in position (by holding Button I). 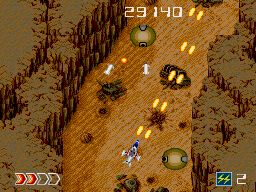 The game has clear and colourful graphics, feeling kind of like a Toaplan shmup (think Twin Cobra or Twin Hawk) mixed with the excellent Dreamcast game Zero Gunner II. It doesn't stray too far from the pack, but Its a fun shooter with engrossing gameplay. 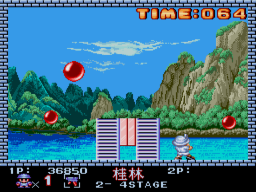 A good port of the 2-player Capcom arcade game that had you traveling the world shooting bouncing bubbles. Pang is a simple, but addictive game with a set-up somewhat similar to stuff like Space Invaders, but the way that the bubbles bounce and split into smaller bubbles when shot makes for a more complex experience, with you needing to aim and dodge at the same time. Its a fun game that's accessible and easy to pick up and play, with a nice 2-player co-operative feature. 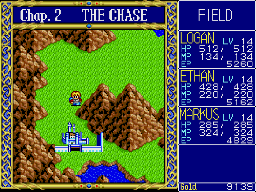 Unfortunately Dragon Slayer is one of the select few JRPGs to get an English release, with the majority of the better RPGs on the system never leaving Japan (for those willing to play through their RPGs with a FAQ these include Anearth Fantasy Stories, Gulliver Boy, and the Far East of Eden and Legend of Xanadu series'). Nevertheless whilst Dragon Slayer is an early release it still manages to be a worthy purchase for RPG fans. There's certainly some grinding involved, but its a lengthy title with some funny (voiced) dialogue and a certain degree of strategy to the later battles. 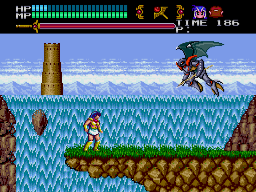 One of the better platform games on the system, Valis 3 has you playing as Yuko, a girl who wields the magic sword of Valis. 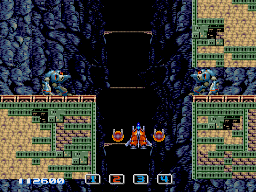 Gameplay here is very challenging, but the levels in the game are consistently well designed and often unique, sometimes even requiring some problem solving. On top of a standard melee attack the game gives you magic casting, and a skid move (with the odd application of clearing gaps that cannot actually be jumped), you can also swap between multiple characters with different abilities whenever you want. A save feature means that you don't have to worry about replaying those especially tricky stages. For big fans of the game, the first, and fourth in the series are also also on PC-Engine, and are marginally decent, though cruder in gameplay, and less inspired in regards to variety.